Lightly grease 13x9 inch baking pan; set aside. 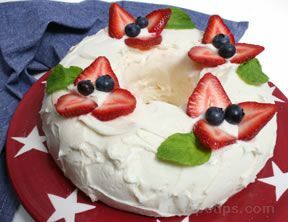 Bake cake mix, yogurt, eggs, oil and gelatin in large bowl with electric mixer at low speed about 1 minute or until blended. Increase speed to medium;beat 1 to 2 minutes or until smooth. Spread batter in prepared pan. Bake 38 to 43 minutes or until toothpick inserted into center comes out clean. Cool completely. Reserve 1/2 cup whipped topping. Spread remaining topping over cooled cake; score into 14 rectangles. Cut each strawberry lengthwise into 6 wedges. 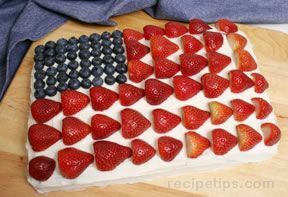 Place 5 strawberry wedges in each rectangle on cake, pointed ends toward center, making flower. Tint reserved whipped topping with yellow food coloring; place in resealable food storage bag. Cut off 1/8 inch from corner of bag. Pipe dot into center of each flower. 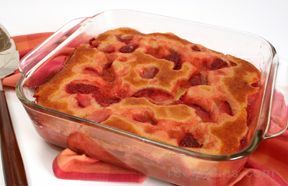 Serve cake immediately, or loosely cover and refrigerate up to 24 hours.